I had the sudden urge last weekend for a real loaf of pain au chocolat – something which I can’t recall ever having when I actually lived within walking distance of fabulous bakeries who baked theirs up daily. Now, of course, I live in the middle of no where, and the closest bakery is the one in the grocery store that does Cake Wrecks quality masterpieces and dried out loaves of faux Italian bread. If I wanted pain au chocolat, I was going to have to bake some. I used the delicious – and simple! – recipe I found on La Tartine Gourmande. In a bowl, mix the flour with the yeast, make a hole in the middle. Add the sugar and a pinch of salt, then add the soft butter, piece after piece, waiting each time that each piece is asborbed. Then one by one, add the eggs, mixing well between each. 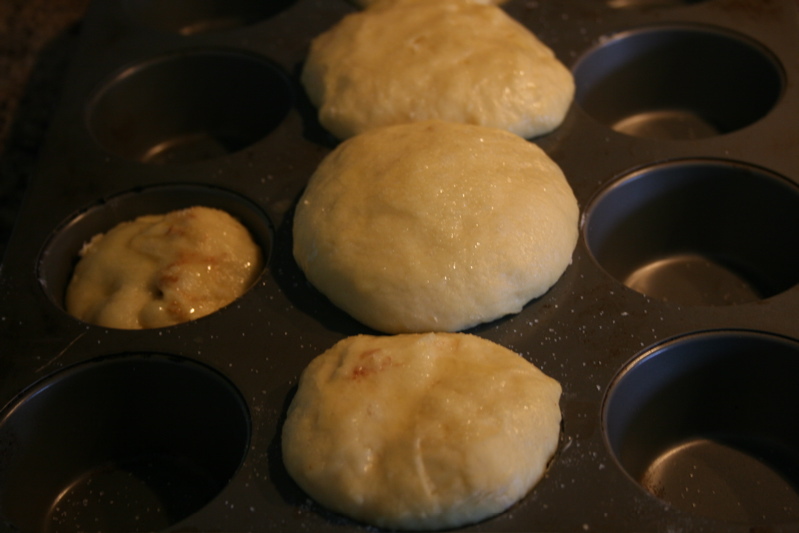 Work the dough until it is elastic and detaches from your fingers more easily (or from the bowl of the stand mixer). Work the dough again for 10 min and divide it in four balls. Place them in a greased rectangular mold and cover. Let rise for an hour again. Brush the brioche with the egg yolk mixed with a dash of sugar. With a pair of scissors, make small cuts at the top of each ball. Place in the oven to bake for 10 min then reduce the heat to 350 F and bake for about 20 to 30 min. Remove, unmold and let cool on a rack. I made a few changes, however, first of which is that I also made a ganache – a ghetto ganache, no less. Most ganache recipes insist that unless you use top quality, $200 per ounce Varhlona Chocolate, you are going to gourmet hell, where are the meals come from Arby’s, and all the chocolate is actually ‘chocolate flavored candy’. Since I didn’t have $200 to spend on chocolate, and wouldn’t have been able to find any even if I did, I instead did what any self respecting frugal gourmet would do, and hit the dollar store. There, I found imported bars of pure Dutch chocolate with an 80% cocoa rate – and yes, for a dollar. I snagged three of them, along with some handy slide lock freezer bags for this weekend’s upcoming project (code name: Towering Stank Clouds). Place the chopped chocolate in a medium sized stainless steel bowl. Set aside. Heat the cream and butter in a medium sized saucepan over medium heat. Bring just to a boil. Immediately pour the boiling cream over the chocolate and allow to stand for 5 minutes. Stir with a whisk until smooth. If desired, add the liqueur. 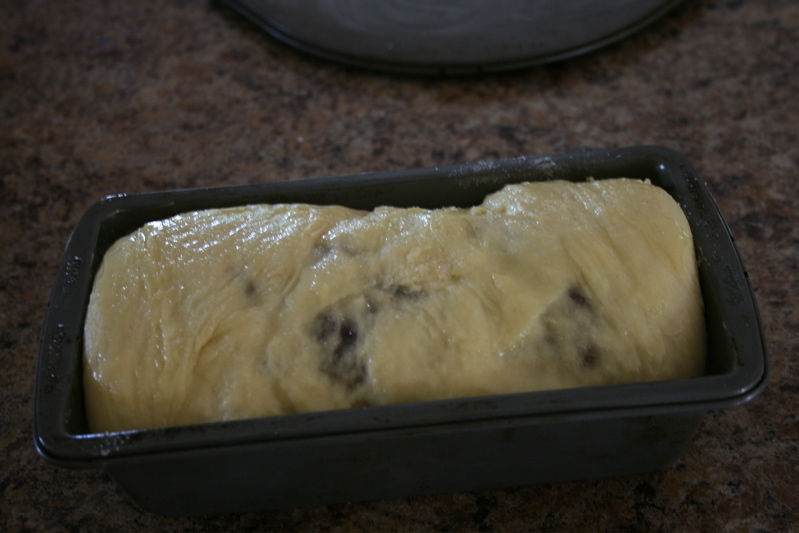 To create the pain au chocolate, I took the worked dough and rolled it out into a rectangle. I then spread the ganache across the rectangle, leaving a 1/2 margin around the ganache. I then rolled up the rectangle, pinching off the edges as I went, and shaped it into a tube roughly the dimensions of my loaf pan. I then left it to rise. Since I had some left over dough and ganache, but not enough to make an entire second loaf, I formed the dough into balls, filled them with ganache, and tossed them in a muffin tin to rise. 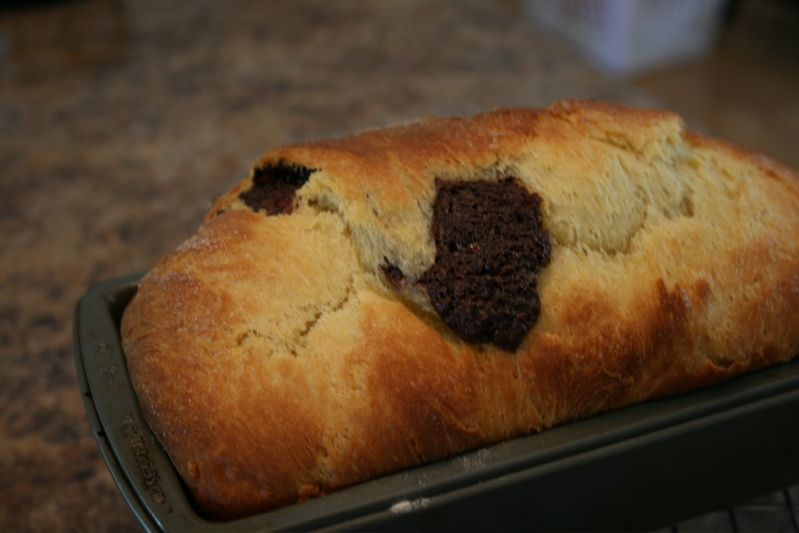 I glazed them with egg wash, and sprinkled them with granulated sugar, and baked for about 35 minutes at 350 F.
They turned out quite nicely – the ganache was warm and oozing out of the bread, and the smell was unbelievably gorgeous. It didn’t stick around long.. in fact, not even long enough for me to get a picture of the sliced loaf! I made bread! Bread, bread, bread! Real, live, honest to God, yeasty bread! Sorry, let me just calm down. I’ve always had an irrational fear of making bread. I figured it was one of those things that required specialized skills to be able to master – perhaps an extra set of female chromosomes or something. At the very least, I figured I needed a bread lifter thing (what the hell is that called? made of wood? Like a big paddle?) or one of those pizza stone things. I didn’t think I could just toss it on a baking sheet and throw it in the oven, and yet oh – how wrong I was. 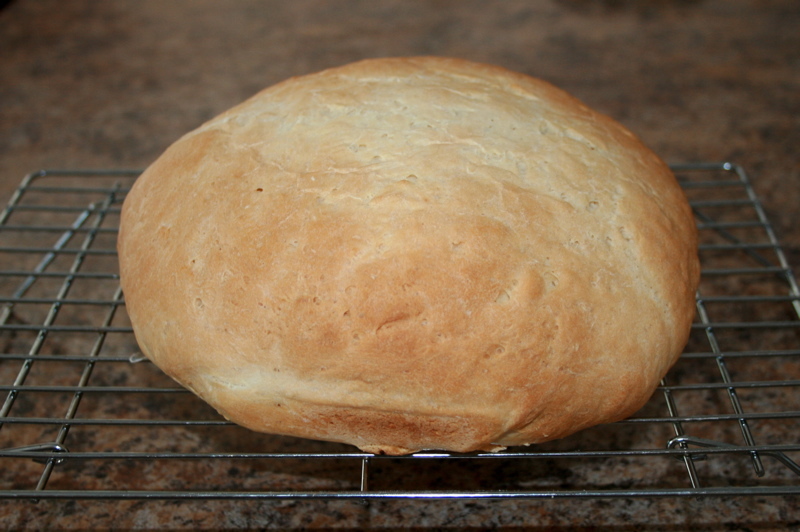 Bread making is easy! I used the following recipe, with a few simple modifications.